The lion cut was originally the term used by vets to explain to cat owners what their cat would look like when it was returned to them after the vet had taken off the matted coat of their cat. Over years the lion cut has become a rather stylish alternative to the original full coat of the cat. 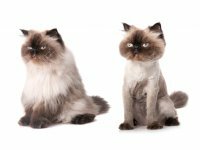 The Lion Cut can be achieved in a number of different styles depending on what the cat owner finds more pleasing to the eye, after all it is a drastic clip. To give you an idea, your cat will end up looking like he/she is dressed for pantomine. I personally like this clip, and it also allows the cat owner to enjoy their pet without any of the hard work of everyday grooming. 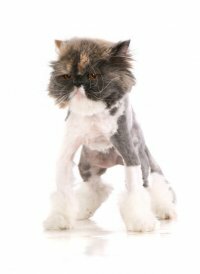 With the lion cut you can choose different styles for the head legs and tail depending on the condition of your cat’s coat. The head can either be a whole mane (like a lion), or a huge ruff, or simply clipped just to frame the face. Legs can either be long, knee high or ankle, and the tail either half, a tuft on the end (lion like) or just a hygiene inch round the top!